Easy-to-use capsules, is an advanced fat burner formula. 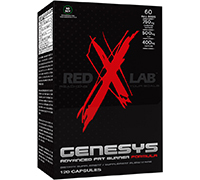 Genesys, in easy-to-use capsules, is an advanced fat burner formula. This unique supplement increases the maximal rate of fat oxidation during exercise, helps in the preservation of lean mass, increases energy levels and reduces the metabolic stress of exercise therefore promoting a quick recovery between workouts.